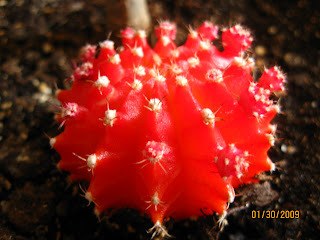 Take a good look of that amazing cactus head, did I mentioned that I got a cactus here? I choose that as my inside plant, hoping that I'll be able to take good care of it. But WRONG!!!! one day, while I was an dusting the furniture, I accidentally hit the plant and it fell down on the floor broken. Yes, the head was separate from the body. I know, I'm cruel but it was an accident. In order to restore the damage. I still plant the body, and even the head hoping that it'll grow back. Roots will comes out from that red head, I know I was thinking dumb. oi ka nice. nindot ra ba siyah color sis. it's really recommended to have plants inside the house. ow, that is so sad. I hope it will still grow. 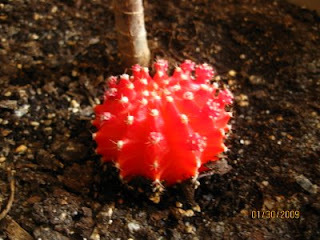 This is the first time I've seen a red cactus. I mean as red as this.